1. Do i need a Prescription ? Yes, Prescription medication is only available by prescription. Every one of our contracted pharmacies requires a valid prescription written by a medical practitioner licensed to practice in your area of residence. All prescriptions must be written in English. 2. How much medication can you supply at once? Our contracted pharmacies are able to dispense up to a 3 month supply of medication at a time. If any refills are remaining on the prescription, it will be kept on your patient profile until you are ready to refill with us again! 3. Is Safemeds4all.com.com a pharmacy? No, Safemeds4all.com is not a pharmacy. We are a online prescription referral service which provides our customers with direct access to affordable prescription and non-prescription medications. With our contracted International pharmacy and international pharmacy care providers, we provide our customers world-class service and access to a wide range of products and services. 4. Will you ship any medication ? Do you sell controlled medication ? Our contracted pharmacies do not ship narcotic and controlled substances such as tranquilizers or opiate-containing medications. Safemeds4all.com reserves the right to refuse to accept orders for medications where there is a concern for potential abuse. 5. Do your contracted pharmacies source medications internationally? Yes, our contracted pharmacies do source prescription medications from the foreign jurisdiction in which they are located. All prescription medications internationally sourced by our contracted pharmacies meet the high standards of the country of origin. Patients will always be made aware of where their medication is being sourced from when placing an order online or through our toll-free phone number. 6. Where else do you ship aside from the United States? Our contracted pharmacies also ship to Australia, Brazil, Switzerland, Chile, China, Costa Rica, Spain, France, Hong Kong SAR China, Israel, Italy, Japan, Mexico, New Zealand, Philippines, Romania, Singapore, and El Salvador. 7. How long is my prescription good for? One year from the date the prescription is written, and then kept on file for approximately 2 yrs. 8. Are my drugs coming from international dispensaries? 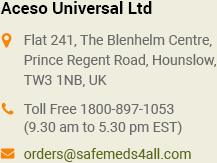 safemeds4all.com gets its orders shipped through Authorised International Contracted Pharmacies for savings and availability on medications, the medications do however go through a testing screening process. 9. Which are the countries where safemeds4all does not ship? Being a Responsible Online company, we are aware that the Laws in several countries prohibit the importation of medication. As such we do NOT ship to the following places, Barbados, Cuba, Syria, Ghana, Indonesia, Iran, Iraq, Nigeria and Lebanon. We do however currently ship to most countries including the U.S.
10. What do I do if I have a problem with my order? You can click on Live Chat and get answers to most questions immediately. You can also give us a call at our Customer service Number or Email us and a customer service representative will be happy to answer any questions you may have. Please see our Contact us page for our hours of operation. 11. Can I combine my order with my Medicare co-pay? safemeds4all.com, cannot co-pay with your Medicare program, however in over 90% of cases we can save you more money than Medicare while ensuring your catastrophic coverage. 12. How do I contact someone at safemeds4all.com? You can contact us through Live Chat to speak with an online representative immediately. 13. What guarantee do you offer that I will receive my order? 14. How can I email someone at safemeds4all.com my questions or concerns? 15. When should I expect a response to my e-mail inquiry? 16. What are generic drugs? Generic drugs are identical to or the bio equivalent of a brand name drug in dosage form, safety, strength, quality, how it is taken, performance and intended use. 17. Why can't I buy Valium, Tylenol #3 or similar medications from your website? 18. Why do generic drugs look different than their brand name counterpart? Trademark laws do not allow a generic drug to look exactly like the brand-name drug. However, while colors, flavors and other inactive ingredients may be different, the drug must duplicate the active ingredient. 19. How much does shipping cost for my order? Free Shipping Worldwide All orders qualify for free Standard Shipping worldwide with an average delivery time of 21 days to addresses in the U.S., Canada and most European countries. 20. Do I get charged a shipping fee for each prescription on my order? No. The shipping fee is applied once, no matter how many prescriptions are on each order. 21. Why is your average shipping time 21 days? The delivery time is 7 to 28 days. Shipments may be delivered in less time. It is best to allow the 21 days to ensure that your medication is delivered to you without interruption. So its better if you order your medication in advance. 22. Will you accept my insurance? Unfortunately no. We operate outside United States and because of this we cannot accept any foreign insurance. We will provide you with a proper receipt for insurance purposes. Your insurance company may or may not accept our receipts. 23. What methods of Payment do you accept? Do you accept all credit cards? We offer the following options to pay for your order(s): Credit Cards: We accept Visa and Mastercard for those people wishing to use a Credit Card. Unfortunately we DO NOT accept Discover Card, American Express, Diners or any other form of credit card not listed. This is because the processing fees in most cases are far to great so that is it not economically feasible to accept them. 23 (a). What will appear on my bank statement if i pay with Mastercard ? If you complete your payment with a Mastercard on our site, the billing descritor on your card statement will show up as "24hrsrx.com8669728765". 24. Are all my drugs available through safemeds4all.com? No. We do not have all medications that are available in other parts of the world. We do have the majority of medications that are available. 25. I have an email address, why do I not get emails (receipts) from safemeds4all.com? In some cases, your email provider may mistakenly hide messages from safemeds4all.com. You can correct this by adding safemeds4all.com to your Safe Senders list. 26. What are your hours of operation? Our Call centre (Sales , Refill, Support & Order) is open 24 hours a day, 7 days a week, 365 days a year. 27. What currency are the prices listed on safemeds4all.com? All prices appearing on the website are quoted in United States Dollars (USD), but if you want you can check the price of the medication in the following currencies as well, GBP, Canadian Dollar & euros but the transaction will only be processed in (USD). 28. Why do the pills I received look different than the ones I get from my local pharmacy? Firstly, if you are used to Brand Name pills and you have ordered a Generic from us, the pills we send you will look different. Generics do not look the same as the Brand Name products, even though they have the same active ingredient and work in the same way. In addition, the same Brand Name pill may look slightly different coming from another country. 29. Are there any additional charges? No. Our prices include shipping and sales tax free. 30. Why do I have to fill out a health profile form? 31. Why is the price different from the last time that I ordered ? 32. Do i need to fill out the forms each time i place an order ? 33. How do i know if my order is being processed ? You may log in to your account with your username and password and view where your order stands. Otherwise, please feel free to contact us regarding any questions. 34. Will you ship any prescription drugs ? We do not ship tranquilizers or opiate-containing drugs. We reserve the right to refuse to dispense orders for drugs where we are concerned at the potential for abuse. 35. What is the difference between a brand name and a generic drug? There isn't much of a difference except for the name of the drug itself, and of course the price. Manufacturers of certain drugs assign brand names to that pill for marketing and advertising purposes. Generic drugs are offered under the actual chemical name. Backed by standard practice and state laws and statutes, generic drugs have to contain the same ingredients, and be equivalent to a brand name of the same drug. So with a generic, you get the same active ingredient, dosage, potency, and medicinal form as a brand name drug, offering the same effectiveness as well. 36. How are generic medicines sold for so cheap? The reduced cost of generic medicines being sold is attributed to the way that it is manufactured. Companies that specialize in manufacturing generic medicines do not have to invest in any research and development or pay for advertising and marketing. Their sole purpose is to create and produce generic medicines for brand names that already have their name out there and do not need more marketing to be done. 37. Are the generic pills sold here FDA approved? The generic pills that are sold on our website are developed and manufactured by top most reputed pharmaceutical companies in countries like Turkey, Canada & India they have the statuary approvals from their respective FDA in their own country. 38. Are generic drugs as safe as brand name drugs? Absolutely. Both brand name and generic drug facilities meet the same standards of good manufacturing practices. In fact, an estimated 50% of generic drug production actually comes from brand-name companies. These companies frequently make generic equivalents of their own or other brand name prescription drugs. At safemeds4all , Customer Safety is our Top most principle which shall never be ignored. 39. Are generic drugs as effective as brand name drugs? Essentially, yes. A large percentage of people who take generic drugs experience positive results. 40. Why are generic drugs less expensive? New brand name drugs are developed under a patent, giving the company the sole right to sell the drug during the patent period. During this time, a drug company charges more for a brand name drug to recover the costs of developing the drug, which also includes research, marketing and promotion. When the patent expires, other manufacturers can begin to produce and sell generic versions of the brand name drug. 41. Why does the package size differ from order-to-order? The medication comes already packaged by the manufacturer and can change from previous stocked medication. 42. How can i track my shipments ?